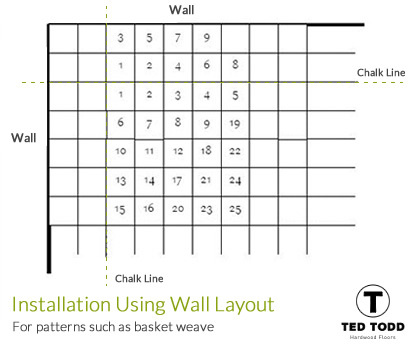 For patterns such as basket weave, the pattern can run out if fitted wall to wall without checking for fitting tolerances. To avoid this it is recommend fitting the blocks in a 5x5 pyramid pattern which will allow you to keep a constant check to ensure the pattern is not running out. After setting out as describe above build the pattern as shown. Once the pattern has been completed continue repeating this pattern across the floor. After both chalk lines (at 90 degrees to each other and #mm from the wall) have been snapped, start spreading the adhesive in the area to be fitted. Continue spreading the adhesive in the working area. Be careful not to spread adhesive beyond the chalk line. Immediately lay the product on the newly spread adhesive. (Do not lay the floor product on dry adhesive) If the adhesive becomes too dry, scrape up the old adhesive and spread more. IMPORTANT: Do not stand or kneel on the newly laid floor during the installation to avoid shifting the blocks. Proper placement of the first block is key to the entire installation. Carefully place a parquet block at the intersection of the two chalk lines. Do not use the edge of the tongue for aligning the block on the chalk lines. Re-check to be sure the starting blocks are properly lined up with the chalk line. This is to assure a square starting area. Do not push too strenuously as this as it could cause the first and second floor pieces to move. If this occurs simply realign them and proceed with the installation. Avoid hammering or forcing the components together as this may destroy the squareness of the product. Maintain the 13 mm expansion space around the perimeter of the room and around all fixed objects. Allow a minimum of 24 hours drying time before moving furniture or walking on the newly laid parquet floor.